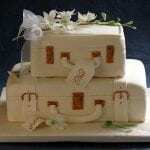 Here at Bryson’s we can create your perfect wedding cake just the way you want it. 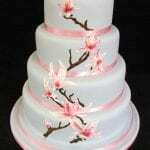 All our cakes are bespoke to each individual customer’s tastes and themes. Whether you are looking for a traditional or contemporary style, you can adapt an existing design or create a completely new idea of your own. All the examples shown here were made in line with our customers’ themes and ideas and are meant to act as a guide only. 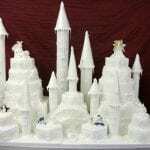 They range from simple stacked cakes to more elaborate designs, such as our famous Fairy Castle. Flowers can be fresh, silk or handmade out of sugar paste; and all our sugar paste figurines can be modelled to look like your wedding party, including clothing. 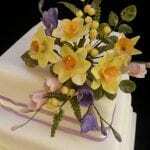 We can create any style of cake in any colour. 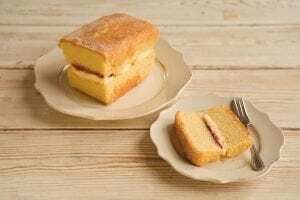 And as all our cakes are baked fresh on our site here in Keswick, you can be assured that our cakes taste just as great on the inside as they look on the outside.